Golden Sands is run by a Manager who has been in our employ since 2005 and is experienced in the care of elderly people. 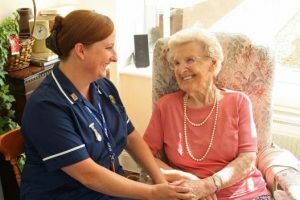 She is supported by NVQ and Diploma qualified Care Assistants who provide dedicated 24-hour support in a professional, caring and thoughtful manner, thus providing a calm, friendly and relaxed environment. We encourage all staff to take up the opportunity of extended training where appropriate. Care staff receive intense training, i.e. Skills for Care and Diploma Awards and all staff receive mandatory training which includes Fire Awareness, Food Hygiene and First Aid. We are always mindful of the fact that ultimately we are only as good as our staff.